Our semi-custom suites are created to allow you to have options of ordering a custom suite but with much more ease and quick turnaround. Scroll down to see how to order or click to view the collection and order now! Pick your favorite suite! This is the hardest part…but we promise, it’ll feel SO good to check it off your list of to-do’s! Choose the paper & printing method. We offer papers from luxe cottons to less expensive options such as our soft house cardstock. Each of the suites are designed so that any paper or printing process will look great! There are 3 printing choices to choose from which will make the cost vary. Descriptions of the paper & processes are below to help you navigate through it all. Enter this info in your order form and sit back & relax! We know how stressful this process can be so we did our best to make it as easy as possible for you! Once you place your order, we will send you an invoice. After we see the initial deposit has been paid, your proof will be on the way to you within 2-3 business days. From that point, you are able to make edits and changes before they go out to print. All your goodies will be at your doorstep within 3 weeks after you approve your artwork! And they’re off! If you need extra work to make these personal and would like us to calligraphy the envelopes with the guest names & addresses, please let us know! We’d be happy to provide that service for you. Assembly and mailing is something that we offer as well! CELEBRATE! It’s time to enjoy the most fun time with all your friends and family! This is our most cost effective printing process…but we don’t skimp on quality! We make sure that you are able to have an unlimited amount of colors used for this process. Our printers use an indigo press that uses high quality inks to distribute the color evenly and create the most beautiful and vibrant colors. This process is only printed on our white house cardstock or light colored papers. This method will not show up on darker color papers. This is also not effective for metallics and will not print white. You may choose this printing process for some areas such as watercolor backgrounds and combine letterpress or foil for the text areas. Letterpress printing is a revival of the old way of printing on the Gutenberg press. Each piece is hand printed and switched out for a clean piece of paper to press the ink into. The ink is pressed into the paper creating a beautiful mark in the paper. We can print on any papers for this process. Any dark or color paper will be difficult to see. Metallics will show up better on white paper but not great and white will not be opaque. This process will not create the same effect as the watercolor illustrations for flat printing. Similar to letterpress, however, metallics and whites are the best with this method. They are clear and precise and each piece will make you giggle inside! We will be able to print on all papers with this method and can also combine all forms of printing to achieve the look that is wanted. Illustrations will show up nicely as long as they are line drawings. Below are your choices and colors that are available for any of the semi-custom suites. Please choose one option that you’d like to use for your suite. The paper that you choose will also have the same envelope to match. Pictured below are the paper thicknesses for Lettra. Our house cardstock pictured below in 2 different weights. Both can be used for letterpress and foil but only the 100# can be used for flat printing. 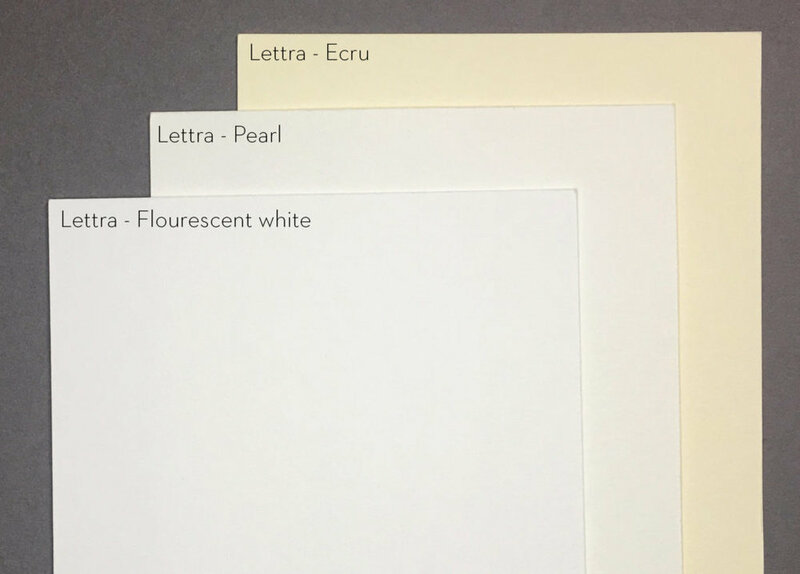 The color is the same as the flourescent white or pearl from Lettra. This is handmade paper which has a natural deckled edge to it. This can be used for letterpress or foil. The best outcome is with foil printing. These are the most requested calligraphy styles below. All styles are handwritten and may be digitized. These can be used in combination with computer fonts to create a mix of styles and a unique look to your stationery. click on the button below to view the collection or fill out the order form and send our way!